Turkish officials condemned Israeli Prime Minister Benjamin Netanyahu's pledge to annex occupied West Bank settlements if he is re-elected, noting that the statement violates international law and destroys peace efforts in the Middle East. In a Twitter message, Presidential Spokesperson Ibrahim Kalın criticized Netanyahu for exploiting elections as a means to justify occupation. Yet another example of how Netanyahu uses electoral politics to justify occupation and undermine the two-state solution. If he is re-elected, will this be a triumph of 'democracy' or occupation? Foreign Minister Mevlüt Çavuşoğlu also said Netanyahu is exploiting elections to garner more votes. 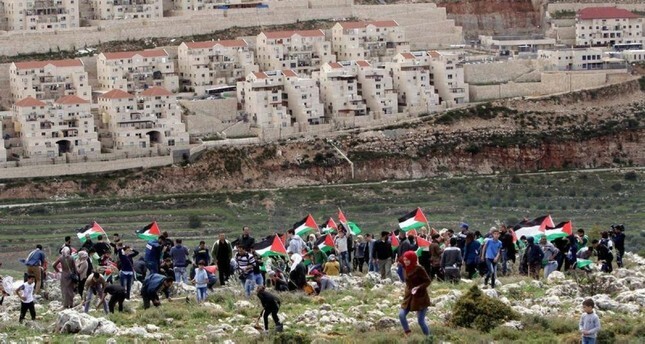 West Bank is Palestinian territory occupied by Israel in violation of int'l law. Prime Minister Netanyahu's irresponsible statement to seek votes just before the Israeli general elections cannot and will not change this fact. The spokesman of the ruling Justice and Development Party (AK Party) Ömer Çelik said Netanyahu's pledge violates United Nations Security Council resolutions and disregards international law. "This pledge not only transgresses the law, but it also attempts to completely destroy it," Çelik said in a Twitter post. "It is about time that the international community says stop to Netanyahu's madness," Çelik said, adding that the Israeli PM's stance is an open attack against the definition of the values that make up the international community. Çelik noted that Netanyahu was encouraged by U.S. President Donald Trump's move to recognize Jerusalem as the Israeli capital and the decision to recognize the Israeli occupation of Golan Heights. He continued by saying that the Israeli prime minister is blatantly risking peace and stability in the Middle East and provokes Palestinians. Çelik also urged all world powers to condemn the discourse of hatred used by Netanyahu. "There is not a single value or legal provision that he [Netanyahu] did not attack," Çelik said and added: "Those who support the occupation of others need to carefully think about the repercussions as it poses the most fundamental threat to international law and security." Netanyahu told an interview on Saturday that he plans to annex settlements in the West Bank if he is re-elected, diminishing any hopes for an Israeli-Palestinian deal on the terms of a Palestinian state on lands Israel captured in 1967. He bragged about "convincing" the U.S. President Donald Trump to recognize Jerusalem as the capital and recognize Israeli sovereignty over the Golan Heights.